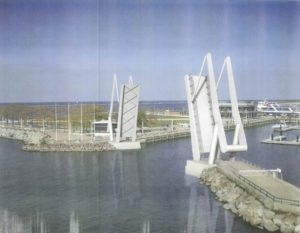 CLEVELAND, Ohio – A pedestrian bridge across North Coast Harbor that has been in the works for more than a decade is finally moving forward at a cost of nearly $17 million. The city could seek bids for construction of the lift bridge by March. Construction of the span linking the west side of the harbor with Voinovich Park could be underway by early 2020. Construction is expected to be completed by June 2022. The project was first envisioned as part of a 2004 plan for the lakefront drawn up under then-Mayor Jane Campbell. Initial plans called for a fixed span. That plan was later rejected in favor of the draw bridge. Bids for construction were opened early this year but were rejected as too expensive. But City Council gave its approval this week for Mayor Frank Jackson’s administration to borrow $6 million from the state for the project. The loan will be paid back over 20 years. That is the last piece of funding for the $16.8 million project. The federal government will kick in about $6.5 million. The city will draw another $4.3 million from general obligation bonds. When completed, pedestrians will be able to cross from an area between the Great Lakes Science Center and the William G. Mather Steamship Museum to the southwest corner of Voinovich Park on the East Ninth Street pier.